The travel gods were smiling on me this year and somehow my business travel just happened to take me to the vicinity San Francisco around the time of MacWorld/iWorld 2014. So I took full advantage of being "in the neighborhood" and arranged to attend. Being the tech geek that I am I can't wait to not only see all the vendors and tech talks but even more importantly meet people from all over the country and the world that share the same passion for technology that I do! This may seem "old school", but I felt like I needed to make some kind of business card that could hand out to the people I meet at MacWorld. Rather than just take the easy route and use an online service to print up a few business cards for me I decided to make some custom cards myself. I started with the Squarespace Logo that I got for free as a Squarespace customer and stuck with the Gattaca theme of my website to design the layout and graphicss for the rest of the card. I started the design layout in Pages, but my very artistically endowed wife (who is also an engineer) bailed me out and took over the project from there. Pages was giving her fits when trying to adjust the text layout of in the standard business card template so she switched to Microsoft Word and finished the design there. After the layout was complete the real work began. The process of getting all of the spacing and margins to work with the card stock I chose to use was a chore. Also, printing out the 2-sided cards and testing out thr printing before actually printing to the card stock was very time consuming. My wife likes doing these types of artistic projects but I think even she was done with art for the weekend when this project was completed. I think the end result was well worth the effort because they turned out really nice. I used a really thick card stock I bought from a local craft store that had a little bit of a textured and raised background so it gave the card a 3-dimensional feel. 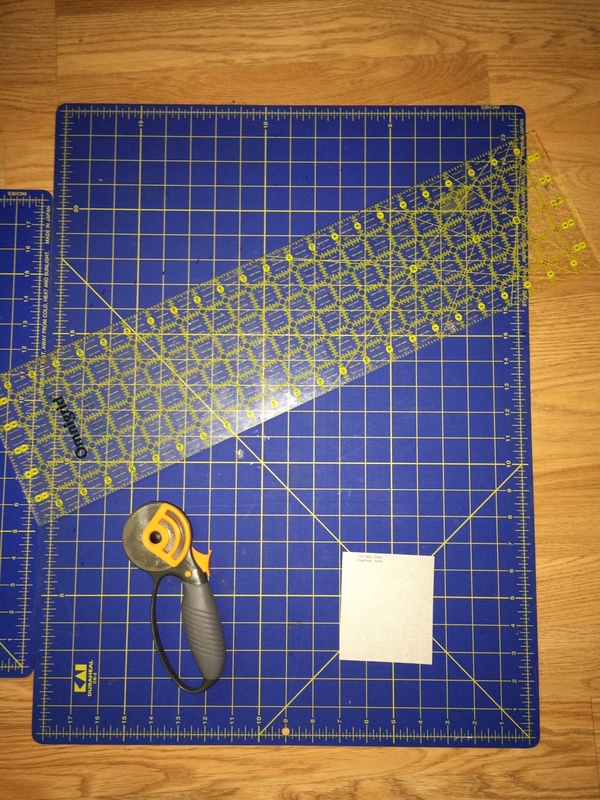 My wife quilts so she already had all the tools necessary (a good rotary cutter and some measured cutting surfaces). See my picture gallery below for a picture of the finished product as well as the materials and tools used. I would NOT recommend going this route unless you have experience doing this kind of work and already have the required tools. Otherwise, you are better off financially just paying a professional service to print you out some really sophistacated looking cards. In the end even paying for high-end cards is going to be cheaper than the materials, tools and the time investment required to do it yourself. I will say that I was able to get exactly what I wanted in this case and for me since we already had the tools it ended up being pretty cheap. The major investment was my wife's time. I think I owe her something from MacWorld now, what do you think? My tech blog here at 1wayswim.com is fun for me and I DO have a day job, so it really hasn't crossed my mind to pay a professional to help me with some of the graphic design and layout for my website. However, I do have a friend (E, yes that is her full name) that is a graphic designer. When I grow my site a little bit bigger I will talk with her about doing some professional design work for my site. I will be at MacWorld/iWorld for all 3 days (March 27-29), so if you are there too track me down and I'll give you one of my cards! Close-up of the card stock I chose to use. Color matches well with the clean industrial look of the Gattaca movie. Tools used for the project, a rotary cutter, straight edge and a good cutting surface.